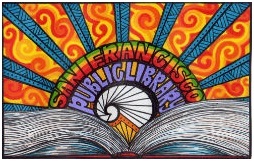 San Francisco, CA – The San Francisco Public Library is holding a Centennial Celebration for its historic Sunset Branch Library on Saturday, April 7 from 12 to 5 p.m. The branch, opened in 1918, was designed by architect G. Albert Lansburgh and built at a cost of $43,955. As its eighth neighborhood branch library, San Francisco created a fine classical building, its design and architectural decorations embodying the hopeful intent of a city eagerly rising, only a dozen years after being reduced to smoldering ruins in the 1906 earthquake. San Francisco was then in a whirlwind of rebuilding and rebirth following the earthquake and the Sunset District in particular was entering a sustained building boom that would transform sand dunes into thriving neighborhoods. Sunset was the fifth San Francisco library built with funding from the American industrialist and philanthropist Andrew Carnegie, who donated nearly $55 million of his fortune to build over 2,500 libraries in America and other countries. The branch has several architectural features typical of Carnegie libraries, including its symmetrical plan and façade, and the steps leading up to the building, symbolizing the uplifting effects of learning for Andrew Carnegie, who rose from childhood poverty to become a rich man. The library was officially designated a San Francisco Landmark in 2004, commemorating the building’s exterior composition and materials, the volume of the main reading room, the ornamental ceiling and its Italianate design. Saturday’s neighborhood celebration will include a performance by the Flying Angels Dance Company, shenanigans with Boswick the clown, a smoothie bicycle, chutney making and tasting, children’s book reading by local author Emma Smith, raffles for gift cards from local businesses, button making and more. In addition, there will be a Sunset District history program led by Woody LaBounty, Lorri Ungaretti and the Western Neighborhoods Project. The event is funded by Friends of the San Francisco Public Library. All programs at the Library are free. San Francisco, CA – Luis Herrera, City Librarian of the San Francisco Public Library, announced his retirement, effective late February 2018. Herrera’s tenure ushered in a new era of library service – one with increased equity and access. The branch libraries were transformed through the Branch Library Improvement Program, spaces were repurposed at the Main Library to create The Mix teen digital center and The Bridge at Main literacy and learning center, and numerous partnerships were formed to foster myriad learning opportunities, innovative and accessible programs and civic engagement for San Francisco residents. Most recently, Herrera worked with Mayor Ed Lee to ensure that all San Francisco libraries are open seven days a week. Herrera has held various positions in the library profession for more than 40 years. In 2012, he was named the Librarian of the Year by Library Journal magazine. Before coming to San Francisco, Herrera served as the Director of Information Services for Pasadena Public Library and the Deputy Director of the San Diego and Long Beach Library systems in California. He has served as President of both the Public Library Association and the California Library Association and is currently a member of the Board of Trustees for the San Francisco Museum of Modern Art. Herrera is the immediate past Chair of Cal Humanities and served on the Board of the Digital Public Library of America. He was also appointed by President Barack Obama to serve on the Board of the Institute of Museum and Library Services. Following Herrera’s departure, the Mayor’s Office plans to appoint Deputy City Librarian Michael Lambert as Acting City Librarian. Lambert has been Deputy City Librarian since March 2014 and has served in four urban libraries during his more than 25 year career. The San Francisco Department of Human Resources will work with a recruitment firm on a national search for a replacement. The Library Commission will vet candidates and forward suggested names to the Mayor for appointment. In the past, this process has taken several months. San Francisco Public Library is dedicated to free and equal access to information, knowledge, independent learning and the joys of reading for our diverse community. The library system is made up of 27 neighborhood branches, the San Francisco Main Library at Civic Center and four bookmobiles. San Francisco, CA – Mayor Edwin M. Lee and City Librarian Luis Herrera today announced that Kim Shuck has been named San Francisco’s Poet Laureate, the seventh artist in City history to hold the title. Shuck is a published author whose poetry focuses on her multiethnic background, which includes Polish and Cherokee heritage, and her experiences as a lifelong resident of San Francisco. Shuck, a Castro resident, has published several full-length poetry books, including Clouds Running In, Rabbit Stories, and Smuggling Cherokee and a chapbook, Sidewalk Ndn. She is also an educator who has taught at all levels, including at San Francisco State University and currently at the California College of the Arts. She has volunteered in San Francisco Unified School District classrooms for more than 20 years. Her visual art works have been displayed in exhibits across the globe. Shuck was appointed by Mayor Lee after being nominated by a nine-member Selection Committee comprised of past Poet Laureates, city officials, and members of the Bay Area poetry and literary community. She will succeed Alejandro Murguía, who served as San Francisco’s sixth Poet Laureate. As the Poet Laureate, Shuck will deliver an inaugural address as the San Francisco Public Library. She will also participate in community-based poetry events that serve multigenerational and multiethnic residents of San Francisco, and lead poetry readings at Litquake, the city’s leading literary festival. In addition, the Poet Laureate works on one or more poetry-centered events in collaboration with the San Francisco Public Library, WritersCorps, and Friends of the San Francisco Public Library. To qualify for San Francisco’s Poet Laureate, applicants must be San Francisco residents and have a substantial body of published work, including at least one full length book and 20 or more published poems in established publications, print or online, over the past five years, among other qualifications. San Francisco, CA –Just in time for summer, San Francisco Public Library is adding an additional, permanent, day of service at nine branch libraries: Anza, Bernal Heights, Eureka Valley/Harvey Milk Memorial, Golden Gate Valley, North Beach, Ocean View, Parkside, Potrero and Presidio branches. This will mean all San Francisco public libraries will be open seven days per week. In addition, Bayview/Linda Brooks-Burton, Glen Park, Ingleside, Mission Bay, Portola and Visitacion Valley branches will gain additional hours during the week. Thanks to the additional hours, all San Francisco neighborhood libraries will be open a minimum of 50 hours each week, with some open 55 hours per week. The San Francisco Main Library is open 60 hours each week. The new hours go into effect starting Saturday, June 17, 2017. “This expansion of service just in time for summer will ensure that youth who participate in the Library’s annual Summer Stride program will have more opportunities and days to take part in free STEM learning programs offered at every branch,” said City Librarian Luis Herrera. The expanded hours promote increased access to library collections, services and materials for all community members. The additional days of service will continue after the summer is over. View a chart of new library hours (PDF). Bookmarks with the new hours will be available at each of these libraries. More information can be found at sfpl.org. 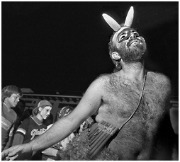 An exhibition of photographs by Thomas Alleman that celebrate San Francisco’s gay community in the mid-1980s, will be on view on the San Francisco Main Library’s Jewett Gallery, beginning Saturday, Dec. 1. The Library is located at 100 Larkin St. in San Francisco’s Civic Center. Alleman’s photographs show a moment in San Francisco’s social history when the first wave of the AIDS epidemic crashed onto the Castro, one of the country’s most vibrant neighborhoods. While the community convulsed with well-earned fear, heartbreak and anger, some people still found the courage and the will to celebrate the dream of a life they’d come to find in San Francisco. This exhibition, Dancing in the Dragon’s Jaws: Gay San Francisco, 1985-1988, chronicles a blizzard of protests, demonstrations, vigils, marches and sit-ins, as the community struggled for social and political recognition of the AIDS crisis. Alleman photographed groundbreaking gay candidates for public office who sought change from inside “the system,” as well as street-level activists whose proud, queer anger drove them to hector that system from the outside. Dancing in the Dragon’s Jaws: SF Gay Culture in the 1980s – Panel Discussion. Jan. 23, 6 pm., Main Library, Lower Level, Latino/Hispanic Community Room. Washington, DC— Yesterday, Associate Justice Ruth Bader Ginsburg administered the oath of office, officially swearing in eight new members of the National Museum and Library Services Board appointed by President Barack Obama. The board is the advisory body for the Institute of Museum and Library Services (IMLS). Members of the board are selected to serve based on their expertise and commitment to libraries or museums. Luis Herrera is the City Librarian of the San Francisco Public Library, where he is responsible for the administration of the city’s 28 libraries. Previously, Mr. Herrera served as the Director of Information Services for Pasadena Public Library, the Deputy Director of the San Diego Public Library, and Associate Director of the Long Beach Public Library in California. In January 2012, Mr. Herrera was named the Library Journal’s Librarian of the Year. 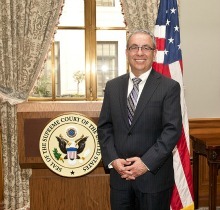 Mr. Herrera serves as Chair of the California Council for Humanities and was appointed to serve on the Steering Committee for the Digital Public Library of America in 2011. He served on the Library Advisory Board of the Bill and Melinda Gates Foundation from 1998 to 2002. Mr. Herrera earned a B.S. from the University of Texas at El Paso, an M.L.S. from the University of Arizona, and an M.P.A. from California State University. For more information about the National Museum and Library Services Board visit the Institute’s Web site at www.imls.gov/about/board.shtm. The National Museum and Library Services Board is an advisory body that includes the director and deputy directors of Institute of Museum and Library Service and twenty presidentially appointed members of the general public who have demonstrated expertise in, or commitment to, library or museum services. Informed by its collectively vast experience and knowledge, the Board advises the IMLS director on general policy and practices, and on selections for the National Medals for Museum and Library Service. San Francisco, 15 November 2012 – The San Francisco non-profit The Children’s Book Project celebrates 20 years of giving away free books to the underserved. That’s 2 MILLION BOOKS in two decades. A celebration will be held on Wednesday December 5th at the Latino/Hispanic Meeting Rooms at San Francisco Public Library from 5:30 pm. Lisa Bishop is a teacher-librarian at Flynn Elementary School, part of the San Francisco Unified School District. She’s been receiving books from Children’s Book Project since it started twenty years ago and is passionate about the work that Pollack and others are doing to promote childhood literacy. “It’s an overhwelming feelings for a child to have a new book. To have a book that they can choose for themselves and keep for themselves. Free books are like the greatest candy bar. Plus you’re creating a society that is literate. A democratic society.” says Bishop. The Children’s Book Project was founded by Vicky Pollack to help build literacy by providing free, new and gently used books to children who need them. Recipients of free books and educational materials include teachers, social workers, librarians and neighborhood drop-in centers. Children who have not developed some basic literacy skills by the time they enter school are 3-4 times more likely to drop out in later years. 1 in 5 high school graduates cannot read their diplomas. 21 million Americans cannot read. 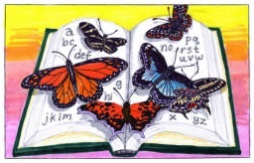 The Children’s Book Project is a non-profit, 501c(3) that relies entirely on donations. It works to help disadvantaged children learn to read by providing children and their shelters, schools, daycare and community centers with books and other resources. Since its beginning in January 1992, the Children’s Book Project has given over 2 million free books to hundreds of facilities serving thousands of children throughout the San Francisco Bay Area. CBP is part of the umbrella organization, First Book San Francisco, working together to provide literacy materials and books to the underserved in the SF Bay area. For more information about The Children’s Book Project, please contact Vicki Pollack or Kathy Katz at 415-401-6315 www.childrensbookproject.org. For more information on the 20th Anniversary event, or First Book San Francisco please contact Michelle Smith, 415-900-6657. 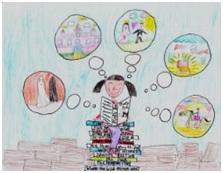 The Mayor’s Office and San Francisco Public Library are thrilled to present the five winning artwork designs in the Library Card Design Contest. The winning card designs feature penguins, butterflies, rays of sunshine, a fox, and the transformative joy of reading books. Some 3,500 designs were submitted to the ImproveSF contest in September and October, then winnowed to 10 in each of five age/grade categories by a panel of judges. The finalists were then subject to public voting at ImproveSF.com. After tallying more than 14,000 interactions, five creative, colorful and powerful designs received the most votes. Description: I am a 2nd grader who loves to read all types of books. I thought about how reading affects me. When I read, I am able to imagine myself in the stories that have been created. I feel all sorts of emotions through reading – happiness, sadness, anxiousness, etc. I am able to imagine all sorts of possibilities for myself through these different writings. Reading builds my imagination. Being free to imagine gives me the power to believe in myself and what I am able to achieve. Description: My drawing shows books can be quite funny and penguins can be too. I think this design should be a library card because people who like floppy penguins and like to read books will enjoy this card. 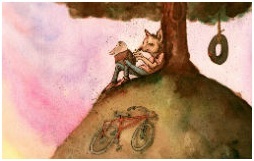 Description: It’s a representation of how books bring stories to life. Description: Reading makes me happy. Whatever I’m feeling, opening a book can make that day even better. Just like a sunny day in San Francisco. ImproveSF is a citywide program that generates opportunities for the City and Country of San Francisco and its residents to work together via online community challenges voted on by the public. 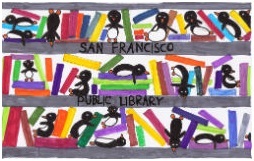 The five winning designs will be featured on new San Francisco library cards issued in 2013. There are more than 400,000 San Francisco library cards in active circulation. San Francisco Public Library issues about 60,000 new cards each year. The North Beach neighborhood is celebrating the groundbreaking of the new North Beach Branch Library at the corner of Columbus Avenue and Lombard Street. The former parking lot site will soon be home to a new seismically safe and accessible library that is 60 percent larger than the old North Beach Branch Library, and a new plaza that will integrate the Library into a larger, greener Joe DiMaggio Playground. A groundbreaking celebration was held Saturday, Nov. 3 with musical performances including Mal Sharpe and Big Money in Jazz and the St. Mary’s Drum and Bell Corps and poetry with former San Francisco Poet Laureate Jack Hirschman. Mayor Ed Lee, Supervisors David Chiu and Scott Wiener, City Librarian Luis Herrera, San Francisco Department of Public Works Director Mohammed Nuru and San Francisco Recreation and Park Department General Manager Phil Ginsburg were are among the city and state officials at the groundbreaking. The North Beach Branch Library will be built “green” and is designed to meet Leadership in Energy and Environmental Design (LEED) Silver certification or greater from the U.S. Green Building Council. The library will also include a public art feature, a sound installation created by artist Bill Fontana. The 8,500 square-foot, two-story building planned for the site will include a community room with after-hours access for neighborhood meetings; a larger children’s area and new teen space; additional public computers; new furniture and equipment; and an expanded collection of books, DVDs, and CDs, including more materials in multiple languages to meet the community’s needs. The construction of the North Beach Branch Library is funded by a bond measure passed by San Francisco voters in 2000. North Beach is the 24th library in the Branch Library Improvement Program. The library will include new furniture, fixtures and equipment. Friends of the San Francisco Public Library is raising funds from private donations to pay for these items. To get involved in the North Beach neighborhood campaign, please contact mary.abler@friendssfpl.org. For more information about San Francisco Public Library, please call (415) 557-4277, or visit sfpl.org.